Bellima replaces KR 125/130 balers with a no-frills, high-capacity offering. 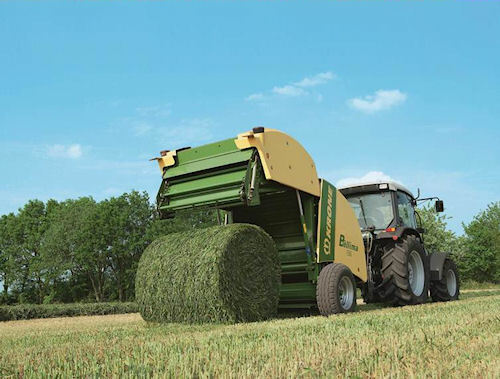 Krone is launching a simple, low-horsepower fixed-chamber baler to replace it's KR125/130 machines. The new model is the Bellima. The Bellima features a camless EasyFlow pickup that operates 30% faster than the earlier models. The new machine also has significantly fewer parts than the 125/130 Series. The Bellima does retain the well-proven chain elevator technology which has narrowly spaced slats to reduce friction and provide for positive bale feed. The bale chamber is fully enclosed to minimize fragmentation. Krone's new Bellima baler offers a low-horsepower, fixed-chamber machine that is more efficient, has fewer parts and has more capacity than its predecessors. The Bellima features no electronics. The operator starts the twine and net wrap system conveniently from the tractor's spool. The net and twine are housed in front of the machine, and the storage compartment offers room for six rolls of twine and two net rolls.